Posted on 4/1/2019, 10:44 am, by sweets4ever, under General Projects. Flowers are a simple way to bring color, personality, and happiness to any space. 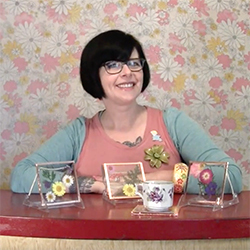 Check out these easy, step-by-step directions to make adorable and affordable pressed flower coasters and sun catchers. Along with decor for your own home, these make great housewarming and teacher appreciation gifts. They are an awesome way to preserve special petals from memorable moments in your life, too! So dang pretty! The coasters, too! « @Home This Weekend: Start Your Garden!